On the morning of September 1, 1859, amateur astronomer Richard Carrington ascended into the private observatory attached to his country estate outside of London. After cranking open the dome’s shutter to reveal the clear blue sky, he pointed his brass telescope toward the sun and began to sketch a cluster of enormous dark spots that freckled its surface. Suddenly, Carrington spotted what he described as “two patches of intensely bright and white light” erupting from the sunspots. Five minutes later the fireballs vanished, but within hours their impact would be felt across the globe. That night, telegraph communications around the world began to fail; there were reports of sparks showering from telegraph machines, shocking operators and setting papers ablaze. All over the planet, colorful auroras illuminated the nighttime skies, glowing so brightly that birds began to chirp and laborers started their daily chores, believing the sun had begun rising. Compared to today’s information superhighway, the telegraph system in 1859 may have been a mere dirt road, but the “Victorian Internet” was also a critical means of transmitting news, sending private messages and engaging in commerce. Telegraph operators in the United States had observed local interruptions due to thunderstorms and northern lights before, but they never experienced a global disturbance like the one-two punch they received in the waning days of summer in 1859. 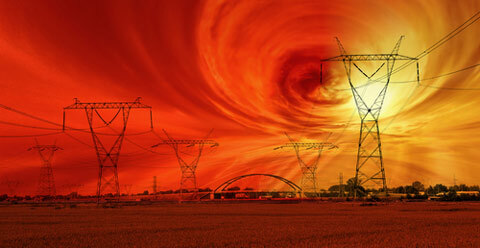 Many telegraph lines across North America were rendered inoperable on the night of August 28 as the first of two successive solar storms struck. E.W. Culgan, a telegraph manager in Pittsburgh, reported that the resulting currents flowing through the wires were so powerful that platinum contacts were in danger of melting and “streams of fire” were pouring forth from the circuits. In Washington, D.C., telegraph operator Frederick W. Royce was severely shocked as his forehead grazed a ground wire. According to a witness, an arc of fire jumped from Royce’s head to the telegraphic equipment. Some telegraph stations that used chemicals to mark sheets reported that powerful surges caused telegraph paper to combust. On the morning of September 2, the magnetic mayhem resulting from the second storm created even more chaos for telegraph operators. When American Telegraph Company employees arrived at their Boston office at 8 a.m., they discovered it was impossible to transmit or receive dispatches. The atmosphere was so charged, however, that operators made an incredible discovery: They could unplug their batteries and still transmit messages to Portland, Maine, at 30- to 90-second intervals using only the auroral current. Messages still couldn’t be sent as seamlessly as under normal conditions, but it was a useful workaround. By 10 a.m. the magnetic disturbance abated enough that stations reconnected their batteries, but transmissions were still affected for the rest of the morning. When telegraphs did come back on line, many were filled with vivid accounts of the celestial light show that had been witnessed the night before. Newspapers from France to Australia featured glowing descriptions of brilliant auroras that had turned night into day. The sky was so crimson that many who saw it believed that neighboring locales were on fire. Americans in the South were particularly startled by the northern lights, which migrated so close to the equator that they were seen in Cuba and Jamaica. Elsewhere, however, there appeared to be genuine confusion. In Abbeville, South Carolina, masons awoke and began to lay bricks at their job site until they realized the hour and returned to bed. In Bealeton, Virginia, larks were stirred from their sleep at 1 a.m. and began to warble.In cities across America, people stood in the streets and gazed up at the heavenly pyrotechnics. In Boston, some even caught up on their reading, taking advantage of the celestial fire to peruse the local newspapers. Ice core samples have determined that the Carrington Event was twice as big as any other solar storm in the last 500 years. What would be the impact of a similar storm today? According to a 2008 report from the National Academy of Sciences, it could cause “extensive social and economic disruptions” due to its impact on power grids, satellite communications and GPS systems. The potential price tag? Between $1 trillion and $2 trillion.